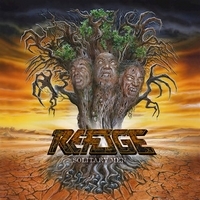 Refuge is Peavy Wagner, Manni Schmidt and Chris Eftimiadis and as Rage they released 5 albums, 2 EPs and a video between 1987 and 1994. Then they parted ways and while Peavy continued with Rage, the others were active in other bands. In 2014 they met and from a fun project it turned into a serious band - Refuge. The opener Summer's Winter shows what to expect from Ra... Refuge. The mid-paced song seems to be written back in the days of Rage, back when Peavy Wagner, Manni Schmidt and Chris Eftimiadis were Rage. For The Man In The Ivory Tower they speed up a bit, a heavy groove and melodic guitar leads is what you get. One of the highlights is From The Ashes, an up-tempo rocker with a catchy hook - just what Rage is about. But can surprise with a spoken words passage and tempi changes. Another one is We Owe A Life To Death which could have been also recorded for the last / next Rage album. Mind Over Matter is a good example what to expect from Refuge. Check it out! Slowly they kick off Waterfalls, a 7+ minutes long tune and the closer of the album which is a melodic rocker and shows a different side of Refuge. Later they speed up a little, but only for a short time. Refuge will satisfy long-time Rage fans as well as fans of powerful heavy metal with Solitary Men! The songs offer a variety within the genre and added a modern production to give it the best sound.